If I could invent a game, what would it look like? I pondered this question last summer after deciding to take The Self-Expression and Leadership Program at Landmark Education in Quincy, Massachusetts. The rules were that the game take place over three months and involve one's community. Aha! I thought. 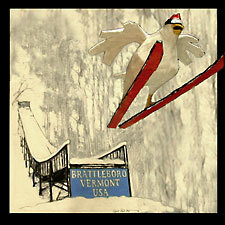 I can finally produce the calendar I always wanted to make and make it about Brattleboro. Except I realized that this idea was too small and could be more powerful if I included other local artists. Thirteen artists to be exact. Celebrate Brattleboro became both the name and the goal of the game. In three months we could celebrate artists, local events, our town, our local printers and framers, and keep the entire project local. 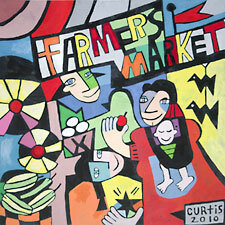 We could show art works in a local setting and sell the calendars through venues in our community. The money earned could be given away to a local nonprofit. A group of artists were invited, and the group met four times with great success. I was astonished by the excitement generated and by how many individuals were willing to take on large accountabilities. Liz Denny would produce the layout. Julie Waters was willing to construct a web page. Elizabeth Johnson interfaced with galleries and spoke about the project on the local radio station. We researched events that happen annually in Brattleboro and contacted the organizations to offer them free publicity in our calendar. After the second meeting, we settled on events and everyone went to work. We created watercolor and oil paintings, collages, pencil drawings, gouache and India ink resists, computer-generated art, pastel drawings, photographs, and a three-dimensional bird skiing down a slope. Minuteman Press quoted us a great price on 500 calendars, and Zephyr Designs agreed to uniformly frame the set. The Works on Main Street gave us an October show with a First Friday opening on October 1, 6 to 9 p.m. C&S Wholesale Grocers gave us a $1,000 grant to cover a portion of initial printing costs. Windham County Reads became our nonprofit sponsor and will receive proceeds from calendar sales. It did not take long to imagine new possibilities for future games. Our website, www.celebratebrattleboro.com, could provide a permanent way for the public to contact artists. We could collaborate on other shows or do a yearly calendar. The most exciting idea was to open an artists-run Coop Gallery downtown in which this group of artists could sell their own future art works. We are already talking with folks who could make this happen for us. What is clear is that we underestimated our greatness. All it took was a declaration: Who wants to play a game? Artists from our community stepped up and played brilliantly. It took so little to have this small project succeed beyond the initial perimeters of our thinking. 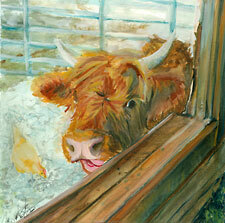 I am awed by the untapped genius, generosity, and outrageous creativity of artists in the Brattleboro area.